Big things are happening! I’ll be a part of a MBTA Poetry News Quiz on Boston Public Radio on WGBH Radio on Friday, April 10th. The news quiz is on around 1:30. With any luck, I will have a collection of MBTA haikus ready then too (however, problems, as we all expected, are ongoing – this is going to end up being an epic collection). I’ll be facing off against Liam Day, who has written a book of poems about MBTA buses. You can stream it online, so tune in. To kick off Poetry Month, I thought I’d share a found poem by Tuli Kupferberg off his album of found poems called No Deposit, No Return. There’s some hilarious stuff on there, some of it very NSFW, but I chose one called “Social Studies,” and you’ll figure out soon enough where it was taken from (click the words “Social Studies” back there to hear it). 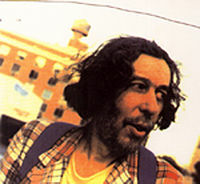 Tuli Kupferberg, out looking for poems.